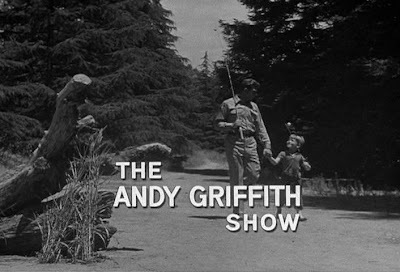 Remember the old Andy Griffith Show? Franklin Canyon Reservoir, located here in Los Angeles, stood in for that North Carolina lake . . .
. . . where Andy Griffith and a much younger Ron Howard walked to go fishing during the opening credits. Franklin Canyon Reservoir is a small (three acre) lake located just north of Beverly Hills in the Santa Monica Mountains. The Santa Monica Mountains cut through the heart of the city of L.A., dividing the San Fernando Valley from the rest of Los Angeles. According to the National Park Service website http://www.nps.gov/samo, this lake is technically the geographic center of the city of Los Angeles. I know, it's unbelievable. The lake, the hills, the trees (and the fact that I tried to avoid photographing homes that you can see from the lake) really gives the illusion of being hundreds of miles from the hustle and bustle of Los Angeles. Early Thanksgiving Day about five years ago I took my kids and members of my extended family to see the lake, and walk around. There is a very simple, easy trail - great for little kids. It's took about 30 minutes to walk around the lake (we took our time). It's really a special little gem in Los Angeles and, of course, is still used as a location for films and television shows. "These commandments that I give you today are to be upon your hearts. Impress them on your children. Talk about them when you sit at home and when you walk along the road, when you lie down, and when you get up ..." Deuteronomy 6:7,8. I love this challenge to believers to integrate their faith into their every day life with their children, rather than compartmentalizing it to a once a week activity. Plenty of places to do that in Los Angeles - including Franklin Canyon Reservoir. Oh yeah, and ducks. I'm not sure if there are ducks there year round, but they were definitely around when we were there in November. The address is "2600 Franklin Canyon, Los Angeles, CA" if you're trying to find it on google maps. Very much enjoyed this blog entry. Many would think me 'corny', but "The Andy Griffith Show" is a special part of my own childhood memories. At its best I think it was something truly special, even beautiful. For my half-hour, the best sitcom that ever aired. I appreciate your weaving the Scriptural admonition into the context of tender, loving, family time -- and using the touching motif of 'Myers Lake' to do so. Thanks David for taking time for your excellent post on the Andy Griffith Lake. Always curious as to it's real location.